The Chesapeake Bay Bridge takes center stage on this VIP helicopter flight! One of Baltimore and Annapolis's most coveted tours! The Chesapeake Bay Bridge takes center stage on this VIP helicopter flight! One of Baltimore and Annapolis's most coveted tours, this sky-bound adventure gives you glorious views of the four-and-a-half mile-long structure. But that’s not all—traveling high above Chesapeake Bay, you’ll also get overhead access to the many yachts and mansions occupying the shoreline. The eye candy is near-endless! And we haven’t even gotten to the best part yet: this Chesapeake Bay Bridge helicopter flight is limited to three people, which means everyone gets a window seat! Moreover, at 40 minutes, the tour ensures you never feel rushed; take all the time you need to frame and capture phenomenal aerial shots. 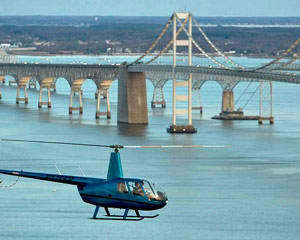 Take a private, 40-minute Chesapeake Bay Bridge helicopter flight! Race speedboats and yachts from high above the Atlantic! Be dazzled by the mansions stretched out along the shorelines! Get remarkable views of The Chesapeake Bridge! Take advantage of your window seat and capture vivid photos! It’s an epic tour that has you swooping over stunning shorelines and admiring beautiful feats of engineering. Round up a loved one (or two of your best friends) and book the adventure now!